Hello! My name is Jack Willis. I live in Madison, Wisconsin, and I study computer science and botany. I'm interested in design and usability, especially on the web. I'm a fan of chiptune music. I support the ecology, labor, civil rights, and criminal justice reform movements. You may email me (PGP), or find me on LinkedIn. 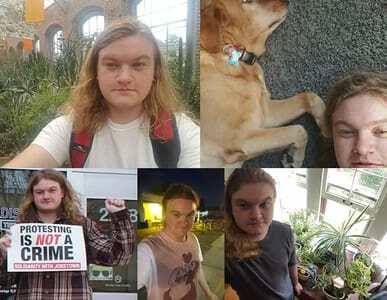 Clockwise from top left: At the Linnean House at the Missouri Botanical Garden; with my dog Ruby; with some houseplants; near Mr. Wizard’s in Maplewood, MO; outside the MATC South Campus on Park St in Madison.